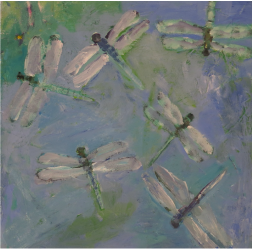 Dragonflies, Acrylic on Canvas, 10"x10"
in life. It is the way I make sense of the world. It allows me to see and focus on the beautiful moments in life : a bouquet of gladiolas that I have picked from my garden, a special shell I've found at the beach. I love color and paint vibrant still-lifes, interiors and paintings of my garden. I'm interested in infusing my work with emotion. View these pages to see my original works in acrylic, oil on canvas and collage. Most of the still- lifes are painted at my home studio in Warwick, MA. Some are painted on my travels in "plein air" or in the soft morning light in my garden.